Made by James Aitchison sometime between 1900 - 1920 and before his takeover of Dollond in 1927, this particular pocket barometer incorporates a curved fahrenheit thermometer and an altimeter. Although these features are often found in pocket barometers, to have all three in one instrument makes this example a little bit more special. 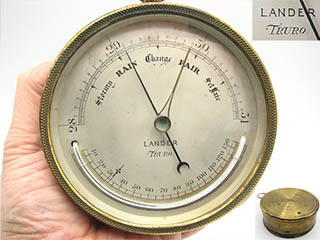 It's also worth noting that the barometric scale is 21 to 31 inches, which is greater than the typical range found on standard pocket barometers, and indicates that its main purpose was probably as an altimeter, for use by mountaineers and balloonists of the period, with a revolving altitude scale up to 10,000 feet. The frosted silvered dial is clean, and engraved 'COMPENSATED, AITCHISON LONDON & PROVINCES'. It also has its original bevelled glass crystal and the case retains all of the original blued brass finish. Housed in a Moroccan leather covered outer case in good condition and lined in silk & velvet, it has a working catch that snaps shut when the lid is closed. In full working order including the thermometer, the barometer measures 50mm diameter and 18mm depth. This is a very elegant Goliath size aneroid pocket barometer and altimeter with a decorative enamel face, made around the turn of the 20th century. Larger than most pocket examples, with the nickel plated case it measures 65mm in diameter not including the stem or suspension ring. The barometeric scale ranges from 26 to 31 inches and an altimeter scale between zero to 5000 feet, with the lettering and numbers clearly printed on a very clean dial, it also has a rotating bezel with a small trend marker to set the last measurement. In full working order, the cosmetic condition of this barometer is excellent and it comes with a modern acrylic stand for display use. This is a superb antique aneroid rope twist marine barometer with an attractive black lettered aluminium dial. Dating from the last quarter of the 19th century, this is a quality barometer in full working order, set in a dark oak body with a bevelled glass. Measuring 9" overall with a dial diameter of 7" and 2.5" depth, this is a substantial barometer weighing just under 1.7kgs. It is in very good condition and combines the appeal of a traditional antique with a strong decorative quality. Made sometime during the second half of the 19th century circa 1870, this Holosteric brass cased aneroid barometer with twin thermometers is signed 'E.G. Wood, 74 Cheapside' and signed as such on the back of the brass case. The silvered dial numbered 3868 is in good condition and has twin thermometers attached, one being a Fahrenheit scale, and the other a Reaumer scale, both of which have intact lines. In good working order the brass case is free from dents, and retains it's patina except on the back where it has been repolished to remove some old felt backing! This is a decorative antique item in very good cosmetic condition, and measures 6.5" at its widest point and 2" in depth. This is an impressive ships Marine barometer retailed by John Barker of Kensington, who were the Harrods department store of their day and dates to around 1915. Set in an attractive turned oak surround, with top & bottom brass wall brackets, it also incorporates a curved centigrade & fahrenheit thermometer on the distinctive aluminium dial and engraved 'Marine Aneroid, John Barker & Co Ltd, Kensington'. Fully functional including the thermometer, this barometer is in very good condition with a quality bevelled glass, and the passing of time has produced a pleasing patination on the oak surround. A substantial yet decorative piece, it weighs just under 1.8 kgs and dimensions are, 10.5" (267mm) diameter on the base, 6.5"(165mm) dial, and 2.5"(63.5mm) depth. 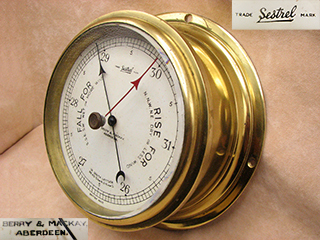 This is an impressive ships Sestrel bulkhead barometer signed 'BERRY & MACKAY, ABERDEEN' who were probably the retailers, as the Sestrel trademark belonged to Henry Browne & Son, the important and highly respected maker of quality nautical instruments, used on naval and merchant ships since the mid 19th century. Housed in a lacquered brass case, with a clean metal dial under a chip free bevelled glass cover, it's in good condition and the brass still has virtually all of its lacquer. A quality instrument, it measures 8" (200mm) at its largest diameter, & 6.5" (165mm) across the front bezel, with a depth of 3". In full working order, a true marine aneroid barometer from the first half of the 20th century, weighing just under 1.7kgs. This 19th century brass cased aneroid barometer is engraved 'LANDER TRURO', and I believe was probably made as a commemorative piece for the famous 19th century explorer Richard Lemon Lander who was born in Truro, Cornwall in 1804. Lander along with his brother were the first Europeans to follow the course of the River Niger between 1830 and 1831, establishing that it led to the Atlantic which greatly contributed to development of trade links between Africa and the rest of the world. Following his early death in 1834, Lander was celebrated as a local hero in Truro, where in 1835 a sculpted memorial monument was built in Lemon Street, which still stands today, as well as naming the local secondary school after him. You can find more details about Richard Landers fascinating life of exploration here: The Richard Lander Story. In good condition all round, the brass case is dent free and the clean silvered dial has a barometric scale ranging from 28 to 31 inches. Weighing just over 750 grams and measuring 120mm in diameter by 46mm in depth, it's in good working order, including the curved thermometer which has an unbroken line. A much rarer version of the popular Negretti & Zambra pocket weather forecaster, this being a wall or desk model measuring 120mm in diameter, and made from brass. Dating from around 1920, this is a larger and more comprehensive forecaster, giving 60 forecast lines, and also a more decorative piece. It carries the same patent number 6276/15 and consists of a circular frame with two rotating discs which set the barometric pressure, wind direction and rise or fall. The main centre disc also has all the directions for use engraved on it, and it's in very good condition with all the text legible. This particular example has been highly polished and displays very well, either on the wall or free standing on its integral stand. An impressive early 20th century surveying aneroid barometer & altimeter signed 'Short & Mason London, Compensated, No J6646'. This is a large precision instrument measuring 125mm in diameter and weighing just under 1.2kgs, and designed for use by both surveyors & mining engineers. Compensated for temperature, the stepped outer silvered scale is calibrated in barometric inches ranging from 28 to 31, and altitudes to 3,000 feet. In full working order, and with only some paint loss on the brass body, it's in very good cosmetic condition including the original fitted leather case. This is a quite unusual 19th century pocket barometer & altimeter, in that among the normal forecasts one expects to see on an aneroid barometer, is the word 'Hurricane'. Dating to around 1880, the silvered dial is signed ' Compensated for Temparature, LENNIE EDINBURGH ’, this would be Eliza Lennie who succeeded her optician husband James Lennie who died in 1854. Housed in a gilded brass case which is in very good condition, the distinctive dial sits under a clear bevelled crystal which in turn is held within the rotating bezel containing the altimeter scale. The barometric scale reads from 28 to 31 inches with an altimeter scale from zero to 3000 feet. In working order, it easily passes the plastic bag test, and the cosmetic condition is excellent as can be seen from the photos. It measures 45mm in diameter not including the hanging ring and comes in its original morrocon leather covered case which is in complete condition, with a working catch and button. This is a very elegant Goliath size aneroid pocket barometer with a decorative metal face, made around the turn of the 20th century. It comes fitted in its original case, with a velvet lined interior which makes for a visually striking piece. The barometeric scale ranges from 26 to 31 inches with the lettering and numbers clearly printed on a very clean dial, it also has a rotating bezel with a small trend marker to set the last measurement. The outer case measures 90mm in width by 110mm in height, and has a folding stand for desktop use. In full working order, the cosmetic condition of both the barometer and its case are excellent. Dating to the second half of the 19th century, this early example of a pocket size aneroid barometer was made by the French instrument makers Dubois & Casse around 1870 and carries their trademark logo of the letters 'D' 'C' either side of a fouled anchor, stamped on the back of the brass case. The barometeric scale ranges from 25 to 31 inches with the lettering and numbers in black print on a clean card dial. In full working order (it passes the plastic bag test) and is in good cosmetic condition with a clean crystal, the brass case is also free from any dents or dings. Measuring just 2¾" (70mm) at its widest point by 1¼" (30mm) in depth, and weighing just over 170 grams, this compact size of barometer was the precursor to the later smaller pocket watch examples, and made in relatively small numbers. A fine example of a brass cased aneroid barometer Compensated for Temperature signed 'T Wheeler Scientific Insts. Ltd. London. Mark I MO 11133/40/48'. Wheeler made many instruments for the military during WW1 and WW2 and this model includes the Meteorological Office (MO) logo on both the dial and case, indicating the item was produced for the War effort in 1940 for use on weather stations and on board weather ships. This particular model was last tested in 1948 at the Meteorological Office while it was still part of the Air Ministry and still has the original testing labels and cardboard case. With a finely graduated matt silver dial, marked in inches of mercury from 26 to 31, it's in excellent cosmetic condition, with a clean undamaged crystal and the brass case has been polished and relacquered. In full working order, measuring 4.5" in diameter, 2" in depth and weighing in just under 800 grams this is precision barometer in good working order from the WW2 period. A very rare desk model made at the height of the Art Deco 1930's period, it's signed ZEISS IKON, BERLIN, on the front glass. This particular example is in superb condition as can be seen from the photos, and I doubt you will find one better. Chromium plated, it stands 6.25” high, and the scale is in inches & millibars and arranged in a semi-circle, with the scale markings clearly printed on the inner surface of the front glass. The indicating & set pointers are behind the scale in front of a frosted glass background, and the operating instructions are printed on the underside of the base, still covered with the original clear celluloid disc. Dating to around 1935, it is in good working order and really is a stunning piece, particularly suitable for any art deco collection or theme. These were made in very small numbers, so this represents a unique opportunity to buy a rare barometer that really does not come along very often. The Air Ministry was the department responsible for managing the affairs of the Royal Air Force, and existed from 1918 to 1964. The barometer has an adjustable bezel barometric scale between 20 to 31 inches with a rotating altimeter scale from zero to 12000 feet. The case is made of gilded brass retaining virtually all of the original gilding and is dent free with a clean dial and crystal. 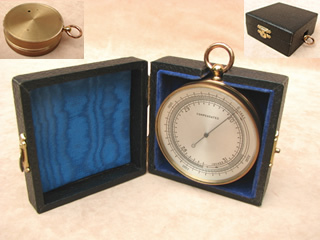 A larger than usual example of a pocket barometer, it measures 65mm diameter by 25mm in depth, and comes in a two part leather case. In good working order, it passes the plastic bag test with the needle rising and falling under pressure as it should. Whilst silver hallmarked pocket barometers are uncommon, this particular example is even more so given its only 35mm in diameter. Compared to its larger counterparts at 48mm in diameter makes this a much more collectable piece, (see photos for comparison). Made by instrument maker and optician Joseph Rankin Stebbing, the son of George Stebbing, he worked in Southampton from 1831 until his death in 1874. A prominent figure in the city he also held the office of first President of Southampton's Chamber of Commerce and later Mayor. Signed 'STEBBING & CO - SOUTHAMPTON' on the aluminium dial, with a scale range from 25 to 31 inches, it's London hallmarked on the bow with the date letter 't' which I believe is for 1874, so probably one of the last pieces made before his death. In good cosmetic condition overall, the dial does have some minor surface marks but the case is free of any dents. It comes with a 12" stylish Albert chain and T bar that would have been used for attaching to a Victorian gentlemans waistcoat, and is in good working order responding well to a plastic bag test. A fine example of a Victorian pocket barometer with a rotating altimeter scale measuring zero to 10,000 feet. In excellent condition, as can be seen from the photos, the case is made of gilded brass and is dent free, with all of its gilding intact. The barometeric scale ranges from 21 to 31 inches and all the lettering and numbers are etched into the clean aluminium dial. Dating to the last quarter of the 19th century there is no outer case, but it comes with a stylish brass albert chain, and in a modern presentation case. In full working order (it passes the plastic bag test), it measures 47mm diameter and 16mm in depth. Collectors of Negretti & Zambra instruments will recognise the extreme rarity of this box model version of the famous weather forecaster. Dating to circa 1915/20 when the ‘weather forecaster’ system was patented, a number of variations were produced and this particular model was made in much smaller numbers than the circular brass or celluloid examples, hence its comparative rarity. As with the other weather forecasters, it’s designed to more accurately predict the weather in conjunction with wind direction & barometer readings, which are then set by the two rotating discs, in the upper half, revealing a letter code in the appropriate window, which will correspond to one of the 26 forecasts printed on a rotating drum, and operated by a knob on the side. Made from a black metal casing this particular example has an ivorine faceplate instead of the usual brass brass type which makes it even rarer. In very good condition, it’s signed ‘NEGRETTI & ZAMBRA, LONDON’ on the faceplate with the inter-twined NZ logo and the patent no 6276/15, the only blemish being a small chip in the bottom left corner of the faceplate, but it doesn't detract too much. Weighing just under 400 grams, it stands just over 5.5” high, 3” wide, and there is a keyhole slot in the back making it suitable for hanging on a wall or standing on a desk/table/mantelpiece. A fine example of a Victorian pocket barometer with a rotating altimeter scale measuring zero to 7,000 feet. Dating to the last quarter of the 19th century, it's signed 'J.HICKS, 8,9 & 10 Hatton Garden, LONDON' on the dial along with 'Compensated' indicating it is compensated for temperature fluctuations. James Joseph Hicks worked in London from 1861, making & selling a wide variety of barometers, becoming probably the most prolific maker of barometers in the country. A staunch Catholic, he presented many meteorological instruments to the Vatican. In excellent condition, as can be seen from the photos, the case is made of gilded brass and is dent free, with virtually all of its gilding intact, the only blemish being a small stain on the base. It comes with its original silk & velvet lined leather case which is also in very good condition with both the hinge and catch in working order, although the button is a later replacement. The barometric scale ranges from 24 to 31 inches and all the lettering and numbers are etched into the silvered metal dial. This is a quality English aneroid pocket barometer in very clean condition. Made by Charles Baker, this is a rare example of a 19th century double sided pocket barometer and altimeter with a separate Singers Patent compass attached to the underside. Engraved on the silvered dial '1270, Baker, 244 High Holborn, LONDON, Compensated' it has a barometric scale range from 23 to 31 inches, with a rotating altimeter scale range of zero to 8,000 feet. The Singers Patent compass has a Mother of Pearl floating dial which pivots on a gemstone bearing and also has a manually operated transit lock. The body is attached to the underside of the barometer by a screw thread & can be removed for access to the barometer adjustment screw. Both cases are made of gilded brass, and in very good condition, with no denting or rubbing of the gilding. As can be seen from the photos the cosmetic condition is exceptional with chip free beveled glass and it's in full working order, (it also passes the plastic bag test). It measures 50mm diameter by 25mm in depth and although there is no case it does come with a modern velvet drawstring pouch for protection. This is a Victorian pocket barometer and altimeter, carrying the name of 'C.S.S.A. Ltd, London W.C.'on the dial. Dating to the latter part of the 19th century, the barometric scale reads from 21 to 31 inches with an altimeter scale from zero to 10000 feet, suggesting it was constructed for use at high altitudes. Housed in a brass case which is in very good condition retaining most of its original gilding, the dial is under a clear bevelled crystal which in turn is held within the rotating bezel containing the altimeter scale. In good working order, it comes in its original fishskin covered outer case which has a working catch, and the interior lined in green silk and velvet. This ingenious invention first patented in 1915 by Negretti & Zambra, is designed to accurately predict the weather in conjunction with wind direction & barometer readings, which are then set by two rotating discs, revealing a letter code corresponding to one of 26 forecasts printed on the reverse. Whilst copies are now available, this is the genuine article carrying the Negretti & Zambra London name and patent no 6276/15. It dates to the 1920's, and comes complete with its original instructions inside the N & Z cardboard box, which althogh a little grubby is still sound. Measuring just 60mm in diameter and of ivorine construction it's in excellent complete condition, and if you have a barometer you need one of these! A rare example of an unsigned antique pocket barometer combination which includes a circular thermometer and a mother of pearl Singers patent style dial, with engraved leaf design surrounding the thermometer bulb. On the opposite side is a traditional clean silvered dial barometer with a barometric scale ranging from 23 - 31 inches and for altitudes up to 8,000 feet. Surrounding the frame is the engraving 'PRESENTED TO MR W H PINCHIN. DERBY. FOR SERVICES RENDERED TO No. 4 DISTRICT COUNCIL OF THE R.S.U.I.P.T.M. 1911'. This is housed in a 3 section leather case with green silk and velvet lining the interior, the central section securing the combination in place for viewing either side. In full working order, the barometer passes the plastic bag test with the needle rising and falling under pressure, the thermometer adjusting to temperature as it should and the compass dial spins freely to find North which can be held in place using the manual transit lock when closed. This is a rare opportunity to buy a piece of TV memorabilia with this impressive Ships bulkhead barometer signed 'John Barker & Co Ltd, Kensington' on the silvered aluminium dial, which was used as one of the props in the 5th series of Celebrity Big Brother in January 2007. It featured in the Manor House task and was used in many of the introductory scenes on the wall of the House, instead of the usual clock. The celebrities who took part in that show included Jermaine Jackson, Shilpa Shetty, Dirk Benedict and the late Jade Goody. Scientific Collectables was one of the task suppliers credited as such on the Channel 4 website Big Brother Task Suppliers page and supplied a number of vintage and antique instruments for the task, of which this was one, directly to Endemol the TV company who produced the programme for Channel 4, and this will come with a copy of the hire agreement signed by their representative. The barometer is brass cased and mounted on an oak back board, with two brass wall hanging brackets, and is of substantial proportions, measuring 11" (280mm) at its widest point with a 6" (155mm dial) & 3.75" (95mm) in depth. It dates to the early 20th century, circa 1910, and is in very good condition overall as can be seen in the photos, with no dents to the brass casing, nor splits in oak back board is also in good condition, no splits, gouges or cracks. In full working order and not only a super item in its own right, it also has the added interest of having featured in a high profile TV show. A substantial instrument weighing just under 1.8kgs the packed weight will be over 2kgs so will have to be sent by courier, which is why unfortunately the international shipping cost is quite high. All buyers please note: due to weight, delivery will be by courier and therefore it is very important that a contact telephone number be entered through the shopping cart at checkout stage, and couriers will NOT deliver to PO boxes! This is a fine antique aneroid rope twist barometer with avery attractive ceramic dial, by Hugh Owen of Bangor. Dating from the last quarter of the 19th century, a quality barometer in full working order, set in a mahogany body with a stylish hand painted and decorative ceramic dial under bevelled glass. Measuring 7.5" overall with a dial diameter of 5" by 2.5" in depth, this is a substantial wall barometer in very good condition, weighing in at just under 1.3kg. A traditional antique with a strong aesthetic quality. This is a late 19th century pocket barometer and altimeter, carrying the name of Negretti & Zambra on the dial. Unlike the majority of pocket barometers which have an adjustment screw through an aperture on the back of the case, this particular example adjusts the needle by rotating a knurled ring on the base which is first unlocked by loosening a small screw on the rim. Dating to after 1870, the barometric scale reads from 15 to 31 inches with an altimeter scale from zero to 20000 feet, which indicates it was constructed for use at high altitudes probably by hot air Balloonists or Mountaineers. Housed in a brass case which is in very good condition, the clean frosted dial reads ‘NEGRETTI & ZAMBRA, LONDON, 13218' Compensated’ and is housed under a clear bevelled crystal which in turn is held within the rotating bezel containing the altimeter scale. It comes with its original outer case having the Negretti & Zambra name along with the Royal Appointment crest inside the lid in gold letters. 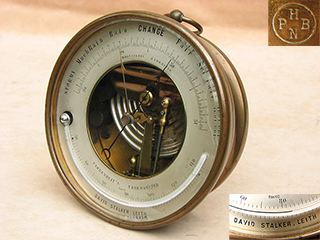 This is a quite unique pocket barometer and altimeter which incorporates not only a curved Fahrenheit thermometer, but also a small floating dial compass. Dating to after 1870, the barometric scale reads from 21 to 31 inches with an altimeter scale from zero to 10000 feet, which indicates it was constructed for use at high altitudes. The decorative barometer dial is marked ‘compensated’ and has a Fahrenheit thermometer scale. It has been plastic bag tested, and the needle rises and falls as it should, the thermometer is also in working order with no breaks in the fluid line, the compass also finds North quite easily, and there is a rotating bezel containing the altimeter scale. Not only is the design of this item unique but the cosmetic condition is also excellent, with a clean undamaged crystal, and comes with the original fish skin covered outer case which has a working catch and button. An exceptional instrument, it measures 45mm diameter and 17mm in depth, and is in good working order. An early 20th century compensated pocket barometer & altimeter with a distinctive black on white enamelled dial, housed in a gilded brass case retaining much of its original gilding. Compensated for temperature, the scale is calibrated in barometric inches ranging from 23 to 31 and for altitudes to 8,000 feet. It comes fitted in it's original velvet & silk lined outer case which is in sound condition with a strong hinge & functional release catch. Measuring 50mm in diameter, its in good working order and readily passes the plastic bag test. Although unsigned, this is a fine example of a precision instrument and still practical for use today. This is a nice example of an antique brass pocket holosteric barometer engraved PHNB and made in the last quarter of the 19th century by the renowned French firm of Pertuis Hulot et Naudet Barometres for the English market. The leather case is marked A.C.L.L. in gold lettering and likely relates to the original owner or association it was issued to, and although it has some light scuffing on the underside and missing its push button, the retaining catch is still functional and snaps shut. The clean silvered dial has a barometric scale ranging from 24 - 31 inches and is marked with a serial number of '2850' at the base. The brass case has lost some of its laquer over the year, but is in sound condition with no dings or dents and a chip free bevelled crystal. In full working order (it also passes the plastic bag pressure test) and measuring approximately 70mm in diameter by 28mm deep, it weighs just over 200 grams without its case. Established by Charles Wastell Dixey & his uncle George Dixey in 1824 when they took over the failing business of William Fraser. Following Georges death in 1863, the company then traded as C. W. Dixey & Son and the business continues to this day as one of Londons most prestigious opticians, having serviced many distinguished customers over their long history, including seven English Monarchs along with many historical figures, noteably Napoleon, the Duke of Wellington and Winston Churchill. The barometer has a centigrade thermometer on the clean silvered dial, which is calibrated in barometric inches ranging from 27 to 32 and for altitudes to 4,000 feet. The case is made of gilded brass in very good dent free condition, retaining virtually all of its gilding. Measuring 75mm in diameter and 28mm in depth, it comes in its original outer case (inscribed 'C.C.C' on the lid) with the makers stamp inside, and although in good condition closing flush it does not lock due to the missing catch. In full working order, this is an exceptional instrument by one of the most renowned makers of the 19th century. This is an antique brass holosteric barometer & curved fahrenheit thermometer marked G.H.&C. Gowland, Sunderland and engraved 'PHNB' on the reverse. Gowland operated as a marine instrument retailer from the 1850's out of Sunderland, but the barometer was manufactured by France's premier barometer makers Pertuis Hulot et Naudet Barometres for Gowland. The enamel on brass dial is in excellent condition and stamped 'Bastet Emailleur Paris' on the reverse, it's also signed 'Gowland' in pencil. Dating to circa 1870 and in full working order, the barometeric scale ranges from 24 to 31 inches with a curved Fahrenheits thermometer. Housed in a brass case with a bevelled glass crystal, this is a quality piece measuring 4.75" (120mm) in diameter, 2" (50mm) deep and weighing just under 700 grams. This is an impressive Marine barometer signed 'HUTCHINSON & JACKSON, SUNDERLAND', who I believe were nautical instrument makers with premises close to the River Wear, and this particular example dates to the last quarter of the 19th century. Set in an attractive rope twist carved oak surround, it incorporates a curved thermometer with both Centigrade & Fahrenheit scales, on a traditional ceramic dial having the distinctive hand painted red capitals, set under a thick bevelled glass within a brass bezel. Fully functional including the thermometer, this barometer is in excellent condition, and the passing of time has produced a warm patination on the oak surround, making this a very decorative piece. A substantial instrument, it measures 8.75" diameter overall with a 6.25" dial, and weighs just over 1.5kgs unpacked. 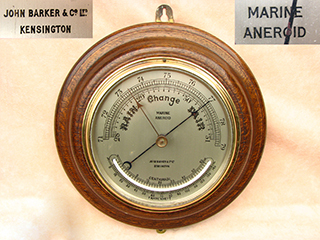 This is a fine example of a late 19th century aneroid pocket barometer & altimeter. Made by Short & Mason, it was retailed by the Army & Navy Co-operative Society stores at the turn of the century. The silvered dial is engraved 'Compensated For Temperature, No G. 38628, SHORT & MASON, LONDON, Made For A. & N.C.S. Ltd. WESTMINSTER.' and has a barometric scale range from 23 to 31 inches, in addition to an altimeter scale ranging from zero to 8000 feet. The case is made of gilded brass and in excellent condition, with no denting and virtually all of its gilding intact. A nice clean pocket barometer with a chip free bevelled glass, it's in full working order, (it also passes the plastic bag test), and measures 50mm diameter by 16mm in depth. It comes with its original silk & velvet lined case in very good cosmetic condition, with both hinge & catch in working order. This is an impressive Marine barometer dating to around 1915, and set in an attractive rope twist carved dark oak surround. It incorporates a curved centigrade & fahrenheit thermomemeter on the distinctive aluminium dial which is in excellent condition, and engraved 'COMPENSATED MARINE ANEROID, John Barker & Co Ltd, Kensington'. However, it was manufactured by Joseph Hicks and retailed by John Barker who were the Harrods department store of their day. The shapely blued steel indicator needle is housed under a quality bevelled glass cover set within a brass bezel. Fully functional including the thermometer, this barometer is in excellent condition, and the passing of time has produced the most wonderful patination on the carved oak surround. A substantial barometer weighing just over 1.5kgs, the dimensions are 9" diameter on the base, 6.5" dial, and 2.5" depth. Please take time to look at all the photos to appreciate the sheer quality of this piece. Made sometime during the second half of the 19th century circa 1880, this brass cased Holosteric barometer was made by France's premier barometer makers Pertuis Hulot et Naudet Barometres and retailed by David Stalker who was himself a maker of watches & nautical instruments, working in Leith from 1855. The metal dial is in good condition with only some minor discoloration along one edge by the 'Very Dry' forecast, and is signed 'DAVID STALKER LEITH'. The brass case is in good condition but has a couple of flat spots around the bezel and some age tarnishing on the rear, which also has the PHNB stamp in a circular logo. In good working order, this is not only a genuine antique but also a functional decorative item with a useful purpose even today. Measuring just over 5"at its widest point, and 2" in depth, a top quality instrument weighing just over 900grams. A fine example of a late Victorian pocket barometer with a curved thermometer and a rotating altimeter scale measuring zero to 10,000 feet. Dating to the last quarter of the 19th century, it's signed 'A.R. BAINES, 39 JAMES St, HARROGATE' on the dial along with 'Compensated'. In very good condition as can be seen from the photos, the brass casing has some age related wear to the finish and is dent free. It comes with a green silk & velvet lined leather case which is also in very good condition with both the hinge and catch in working order. The barometeric scale ranges from 21 to 31 inches and all the lettering and numbers are etched into the clean aluminium dial. In full working order including the thermometer (it passes the plastic bag test), it measures 47mm diameter and 17mm in depth. These aneroid pocket barometers that incorporate the curved thermometer were the deluxe models of their day, and becoming increasingly rarer. This is a rare opportunity to purchase not only a very rare barometer by Negretti & Zambra, but also one of significant historical importance. A drawing of this barometer can be found in the 1864 copy of Negretti & Zambras Treatise on Meteorological instruments, and is shown as an inset in the photo for comparison. After less than a year of production, Negretti & Zambra continued to develop these barometers and in 1861 succeeded in producing the smaller pocket watch size models which are more familiar today. This particular example is easily dismantled by unscrewing the top bezel, and the internal layout suggests a prototype element in the construction, where there is an internal threaded ring allowing for height adjustment of the dial position, to presumably allow experimentation with different size movements. As can be seen from the photos, it is in excellent condition the case retaining much of its lacquered finish, and the thick bevelled glass is free of any damage. The silvered dial is also in very clean condition, signed ‘NEGRETTI & ZAMBRA, London’ and noticeably there is no serial number, again an indication that this was quite possibly a prototype model. Not the most attractive of barometers, but certainly a historically important example that no true collection would be complete without. As the development of pocket barometers progressed rapidly after the 1870's, more advanced models were made with altitude scales far in excess of the standards of the time, and primarily intended for use in balloonist & mountaineering activities. This particular temperature compensated barometer has an altimeter scale between -1000 feet to +20,000 feet making it one of the rarer examples. Made by J H Steward sometime after 1886 as evidenced by the 457 West Strand address on the dial, the barometric scale is contained within a rotating bezel and reads from 15 to 31 inches with all the lettering and numbers etched into the clean silvered dial. In very good cosmetic condition, as can be seen from the photos, the case is made of brass and retains all of the gunmetal finish. It still has the correction card for different temperature levels fitted inside the lid of the original outer case, which is also in good condition with both the hinge and catch in working order. Fully functional (it passes the plastic bag test), measuring 50mm diameter and 16mm in depth. 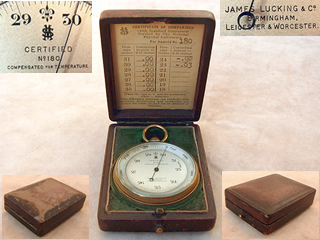 Made by Short & Mason for retailing by James Lucking & Co sometime between 1875 to 1895, this pocket barometer & altimeter comes with a comparison certificate issued by the National Physical Laboratory inside its velvet lined fitted leather case. The silvered dial is engraved 'CERTIFIED, No 180, COMPENSATED FOR TEMPERATURE, JAMES LUCKING & Co, BIRMINGHAM, LEICESTER & WORCESTER' and has a barometric scale range from 23 to 31 inches. The altimeter scale is rotated by the knurled knob at the top, and has a scale range of zero to 8,000 feet. The case is made of gilded brass, and in good dent free condition, retaining most of its gilding with some rubbing around the edges. A clean & tidy pocket barometer with a chip free bevelled glass, it's in full working order, (it also passes the plastic bag test), and measures 50mm diameter by 15mm in depth. The hard leather covered case is also in sound condition with a working catch, and only some scuffing on the underside. 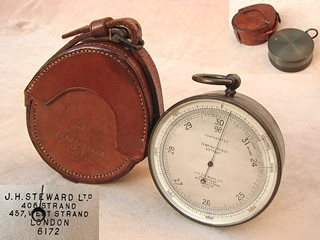 A WW1 period aneroid pocket barometer signed 'J.H.STEWARD Ltd, 406 STRAND, 457 WEST STRAND, LONDON, 6172'. Larger than normal pocket barometers, measuring 70mm in diameter and weighing just over 0.3 kgs, it's a precision instrument probably designed for use by members of the Royal Engineers regiments during WW1. Constructed in bronzed brass, it's compensated for temperature with the outer silvered scale calibrated in barometric inches ranging from 24 to 31, and altitudes to 6,000 feet. In full working order, it's in very good cosmetic condition including the original fitted leather case impressed with the military arrow & the maker's name 'Mark Cross Ltd 1915 Walsall'. A fine example of a Victorian pocket barometer with a revolving altimeter scale measuring zero to 7,000 feet. 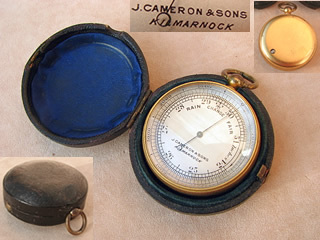 Dating to the latter part of the 19th century, it's signed 'J.CAMERON & SONS, KILMARNOCK' on the dial. The Camerons were Scottish watchmakers so its possible they were retailers for barometers rather than makers. In excellent condition, as can be seen from the photos, the case is made of gilded brass and is dent free, with virtually all of its gilding intact. It comes with its original blue velvet lined leather case which is also in good condition with the catch in working order. The barometeric scale ranges from 24 to 31 inches and all the lettering and numbers are etched into the clean silvered dial which sits under a domed bevelled glass crystal. In full working order (it passes the plastic bag test), it measures 45mm diameter and 15mm in depth. A mid 20th century brass cased aneroid pocket barometer, which although unsigned is a precision instrument, & probably made in conjunction with the Meteorological office. Larger than normal pocket barometers, measuring 70mm in diameter it comes with what appears to be its original plush velvet lined case. Compensated for temperature, the silvered scale is calibrated in barometric inches ranging from 28.5 to 31, and the rotating bezel for altitudes to 3,000 feet. In full working order, it is in excellent cosmetic condition including the fitted case. This is a very rare example of a late 19th century double sided pocket barometer & altimeter with a separate compass attached to the underside. Retailed by the Army & Navy Co-operative Society stores at the turn of the century, it was almost certainly made by Short & Mason who were their main suppliers for barometers. The silvered dial is engraved 'Compensated A. & N.C.S. L. WESTMINSTER.' and has a barometric scale range from 21 to 31 inches, with a rotating altimeter scale range of zero to 10,000 feet. The compass has an English crossbar needle which pivots on a gemstone bearing over a silvered dial, and also has a manually operated transit lock. The body is attached to the underside of the barometer by a screw thread & can be remove for access to the barometer adjustment screw. Both cases are made of gilded brass, and in superb condition, with no denting or rubbing of the gilding. 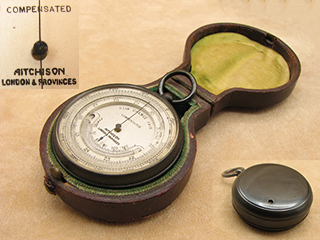 It comes with its original silk & velvet lined case in good cosmetic condition, which has two lids so both barometer & compass can be read in situ. As can be seen from the photos the condition is exceptional with chip free bevelled glass and it's in full working order, (it also passes the plastic bag test). It measures 50mm diameter by 25mm in depth when out of the case. This is an impressive ships Sestrel bulkhead barometer signed 'Harold Adams & Son, Dartmouth'' who were the retailers, as the Sestrel trademark belonged to Henry Browne & Son, the important & highly respected maker of quality nautical instruments, used on naval & merchant ships since the mid 19th century. Housed in a dent free chrome case, with a clean metal dial under a beveled glass cover, some letters of the retailers name on the dial is rubbed. A quality instrument, it measures 8" (200mm) at its largest diameter, & 6.5" (170mm) across the front bezel, with a depth of 3". In full working order, a true marine aneroid barometer from the first half of the 20th century, weighing just over 1.6kgs. This Victorian brass cased aneroid barometer dating to the latter part of the 19th century is signed 'F. Darton & Co, LONDON, Compensated, No 2645' a respected instrument maker who started manufacturing in 1834, with the company continuing well into the 20th century. Although mounted in an impressive oak mantle stand with brass feet, it is in fact a combined barometer & altimeter to 7000 feet so would have been originally used as a portable instrument by victorian travellers or explorers. The stand is probably a later addition but is a perfect fit so must have been made specifically to suit the barometer. In excellent condition all round, the dent free case still retains virtually all its original lacquer & the ivorine dial is clean with crisp lettering. In good working order, the barometer measures 115mm overall diameter with a dial face diameter of 105mm. The oak stand is 10"(250mm) long & 5" (130mm) high with a depth of just over 2" (55mm). A substantial high quality instrument it has a bevelled glass crystal with a needle trend marker attached to a rotating brass bezel, and weighs just over 0.8kg on its own & 1.3kg with the stand. A fine example of a 19th century Victorian pocket barometer with altimeter ring in a gilded brass case. The silvered dial is engraved 'J. H. Steward, 406 & 66 Strand & 54 Cornhill, London, 722' and has a barometric scale range from 19 to 31 inches. The altimeter scale ranges from zero to 13,000 feet on the rotating bezel suggesting it was very likely made for high altitude use such as ballooning or mountaineering. In very good cosmetic condition through out, the brass case is free of any gouges or dents retaining a lot of its original gilding, but with some minor loss on the back. Measuring 48mm diameter (not including the ring & stem) by 17mm in depth, it's in full working order, and the glass crystal is clean with no chips or damage. Dating to circa 1880, it comes with a 5" high, top quality hand crafted Rosewood watch stand made by Steve Jones from the Jones family who have been woodturners for over 300 years. The rosewood stand comes with a signed certificate of authenticity. This mid Victorian aneroid wall barometer is signed 'J Hicks Maker London 10387' on the dial. James Joseph Hicks worked in London from 1861, making & selling a wide variety of barometers, becoming probably the most prolific maker of barometers in the country. In very good cosmetic condition and set in an impressive rich mahogany case, the decorative silvered dial also incorporates a curved mercury thermometer with a fahrenheit scale. In good working order including the thermometer, it has a thick bevelled glass cover, weighs 1.4kgs and measures just over 7.5" diameter overall, with a bezel diameter of 5.5". An early 20th century surveying aneroid barometer signed 'E R Watts & Son, London 2838'. Larger than normal pocket barometers, measuring 80mm in diameter and weighing just over 0.5 kgs, it's a precision instrument designed for use by both surveyors & mining engineers. Compensated for temperature, the outer silvered scale is calibrated in barometric inches ranging from 22 to 31, and altitudes to 10,000 feet. A fine example of a pocket barometer with a revolving altimeter scale measuring zero to 10,000 feet. Dating to the last quarter of the 19th century, it's signed 'E. Saunders, Optician, Oxford' on the dial along with 'Improved Scale, Compensated, Rd 149175'. E. Saunders is recorded as working in Oxford between 1865 to 1885. It comes with its original blue velvet lined leather case which is also in very good condition with both the hinge and catch in working order, although the button is a replacement. In full working order (it passes the plastic bag test), it measures 50mm diameter and 15mm in depth. It dates to the 1920's, and comes complete with a photocopy of its original instructions inside the N & Z cardboard box, which is in good sound condition. Measuring just 60mm in diameter & of Ivorine construction it's in excellent complete condition, and if you have a barometer you need one of these! A superb brass cased 19th century Holosteric barometer, signed "R M NELSON OMAGH", this was Robert Nelson a clock & watch maker who is recorded as working at Georges's street Omagh in County Tyrone, between 1861 -1880. The open faced dial shows the decorative quality of the inner mechanism which is in excellent condition as is the original bevelled glass. In full working order, the brass case is also in good cosmetic condition & has the warm patination which only comes with the passage of time. Please study the photos to appreciate the excellent condition of this piece which has obviously been well cared for. Measuring 5" at its widest point, and 2" in depth, it weighs just over 700 grams. An impressive 19th century aneroid barometer with curved mercury thermometer, signed 'JOHN BRUCE & SONS, 25 SOUTH CASTLE ST LIVERPOOL' who were active during the second half of the 19th century. With a traditional ceramic dial, set under a thick bevelled glass within a brass bezel, it dates to around 1880, and is contained in a ropetwist Oak surround with a brass wall hanging bracket. Measuring just under 7.5" diameter at its largest point, the dial is 5" in diameter, and total depth is 2.5" with an unpacked weight of 1.2kgs. In full working order including thermometer, this is a decorative antique barometer in very good condition, with the only blemish being a couple of fine hairline cracks on the outer edge of the brass bezel, shown as a close up in one of the photos, but in reality only visible on close inspection, which I mention for accuracy. This Edwardian pocket barometer & separate Negretti & Zambra forecaster, both carry the retailer name of W G Whiting, Manchester, showing they were purchased together. Dating to the first quarter of the 20th century, it's signed 'W.G. WHITING Ltd, MANCHESTER' on the dial along with 'Compensated' indicating it is compensated for temperature fluctuations. The barometric scale ranges from 23 to 31 inches and all the lettering and numbers are etched into the silvered metal dial along with the rotating altimeter scale measuring zero to 8,000 feet. In excellent condition, as can be seen from the photos, the case is made of gilded brass and is dent free, with virtually all of its gilding intact, the only blemish being some tarnishing on the suspension ring. It comes with its original blue silk & velvet lined leather case, also carrying the retailer name inside the lid, and is also in very good condition with both the hinge and catch in working order. Designed to be used in conjuction with pocket barometers, the Negretti & Zambra weather forecaster comes complete with its original instructions inside the N & Z printed cardboard box, which is in good condition and is also stamped W G Whiting. In full working order (it passes the plastic bag test), it measures 50mm diameter and 18mm in depth. A fine example of a Victorian pocket barometer which incorporates a curved thermometer & altimeter scale measuring zero to 15,000 feet, suggesting it was very likely made for high altitude use such as ballooning or mountaineering. Dating to the last quarter of the 19th century, it's signed 'J.HICKS, MAKER, LONDON, 7764' on the dial along with 'Compensated' indicating it is compensated for temperature fluctuations. In excellent condition, as can be seen from the photos, the case is made of gilded brass and is dent free, with all of its gilding intact, and the curved thermometer line is intact. It comes with its original velvet lined leather case which is also in very good condition with both the hinge and catch in working order. The barometric scale ranges from 18 to 31 inches and all the lettering and numbers are etched into the silvered metal dial. In full working order (it passes the plastic bag test), it measures 50mm diameter and 20mm in depth. These pocket barometers with thermometer are becoming increasingly scarce, particularly examples in such good condition.. This is an impressive Marine barometer signed 'Rowell Oxford', who I believe was Richard Rowell, a clock & watchmaker recorded as working between 1834 - 1865, and this particular example dates to the very end of that period. Fully functional including the thermometer, this barometer is in excellent condition, and the passing of time has produced the most wonderful patination on the carved oak surround, making this a very decorative piece. A substantial instrument, it measures 9" diameter overall with a 6.5" dial, and weighs just over 1.8kgs unpacked. This is large and impressive ships bulkhead barometer signed 'ALF WILLINGS & CO, WEST HARTLEPOOL' who were nautical instrument makers established in 1887 and continued in business until the 1960's, working from Church street, Hartlepool. Housed in a brass case & set on a dark mahogany backplate, it has a very clean aluminium dial under a beveled glass cover. In very good condition, as can be seen from the photos, the brass case has some bronzing on the top but is free of any dents or dings. It measures 11" at its largest diameter, & just under 7" on the front, with a depth of 4". In full working order, a handsome marine aneroid barometer from the first half of the 20th century, weighing just under 2.3kgs. A late Victorian aneroid pocket barometer by Negretti & Zambra numbered 605, which incorporates a revolving altimeter scale measuring from zero to 10,000 feet. Dating to the around 1890 it's signed Negretti & Zambra London, 605 on the dial and is also compensated for temperature. The straight sided case is made of gilded brass, and is in exceptional condition with absolutely no loss of any of the gilding. It comes with its original velvet & silk lined lined leather covered case, which is also in very good condition with the catch in working order, and although the hinge has had a minor repair, it is quite sound. The barometeric scale ranges from 22 to 31 inches and all the lettering and numbers are etched into the silvered aluminium dial which is housed under a clean bevelled glass. Barometers by Negretti & Zambra are very sought after and this is a superb example in full working order (it passes the plastic bag test), measures 50mm diameter and 15mm in depth. A fine example of a late Victorian pocket barometer with a rotating altimeter scale measuring zero to 8,000 feet. Dating to the last quarter of the 19th century, it's signed 'Chadburns Ltd, 47 Castle St, Liverpool' on the dial along with 'Compensated'. Chadburns are recorded as working at the Castle Street address between 1875 to 1900. The barometeric scale ranges from 23 to 31 inches and all the lettering and numbers are etched into the clean aluminium dial. No case, but it comes with a brass double albert chain from the same period. This is a neat & tidy English aneroid pocket barometer , in very clean condition. A late Victorian aneroid barometer signed 'Thomas Armstrong & Bro, Manchester & Liverpool, No 713' on the dial. This company was established in 1875, and were prolific makers of top quality barometers. Dating to around 1890, this is a genuine antique barometer in full working order, set in a brass case, with a very decorative silvered dial and thick bevelled glass. The barometer can be adjusted by means of an adjustment screw on the back and measures 135mm diameter at it's widest point, and 55mm in depth. Cosmetically in very good condition, with a clean dial and glass, the brass case is in original uncleaned condition. A fine example of a late Victorian pocket barometer with a rotating altimeter scale measuring zero to 4,000 feet. Dating to around 1890, it's signed 'R & J BECK Ltd, LONDON' on the dial along with 'Compensated'. The makers were Richard & Joseph Beck who excelled not only in the manufacture of barometers, but were especially renowned for their microscopes & photographic lenses. In exceptional condition, as can be seen from the photos, the case is made of gilded brass and is dent free, with virtually all of its gilding intact, and only superficial scratches. It comes with its original green silk & velvet lined leather case which is in very good condition with both the hinge and catch in working order, and also has the makers trade label showing the 68 Cornhill address in the lid. The barometeric scale ranges from 27 to 31 inches and all the lettering and numbers are etched into the clean aluminium dial. Dating to circa 1885, this is a nice example of a Negretti & Zambra aneroid pocket barometer & altimeter. The silvered dial is engraved 'Compensated , NEGRETTI & ZAMBRA LONDON, 10790' and has a barometric scale range from 23 to 31 inches. The case is made of gilded brass, and in very good condition, retaining virtually all of its gilding. A very clean & tidy pocket barometer with a chip free bevelled glass, it's in full working order, (it also passes the plastic bag test), and measures 50mm diameter by 15mm in depth. It comes with its original green silk & velvet lined case which is generally in good condition although the hinge has some play in it, and as with most of these antique cases is missing its push button, but has its retaining catch so still snaps shut. During the late 1860’s Negretti & Zambra produced a limited number of aneroid barometers specifically for use by balloonists. These pocket size barometers were made with altitude scales far in excess of the standards of the time, and this particular barometer has a scale up to 20,000 feet which makes it a little bit special. It's likely this barometer was made on a wholesale basis at Negretti & Zambra for onward retailing by Lennie in Edinburgh and the silvered dial is engraved ‘Compensated, LENNIE EDINBURGH'. The barometric scale is contained within a rotating bezel and reads from 15 to 31 inches with an altimeter scale from zero to 20,000 feet, with all the lettering and numbers etched into the clean silvered dial. In very good condition, as can be seen from the photos, the case is made of gilded brass and is dent free, with the majority of its gilding intact, although a little patchy on the underside. It comes with its original silk & velvet lined leather case which is also in good condition with both the hinge and catch in working order. In full working order (it passes the plastic bag test), it measures 50mm diameter and 16mm in depth. Made by Elliott Brothers sometime between 1864 to 1886 which is the period that they operated from the 449 Strand address, this is a pocket barometer with an unusually narrow altimeter range of only -1000 feet & + 1000 feet, which indicates it was intended for use by surveyors or mining engineers, as its calibrated to measure depths down to 1000 feet. Housed under a bevelled glass crystal, the silvered dial is signed 'Elliott Bros, 449 Strand, London' and is compensated for temperature. In very good condition as can be seen from the photos, the brass case retains virtually all its gilding, and is elaborately engraved with what appears to be the initials of a previous owner on the reverse, see photos. It comes with its original blue velvet lined leather case which is also in very good condition with both the hinge and catch in working order. A fine antique wall mounted barometer with the distinctive red & black letters on an attractive ceramic dial, signed 'WILSON PENRITH'. Dating to the early part of the 20th century circa 1910, this is a quality barometer in full working order, set in an octagonal shaped carved Oak body decorated with an oak leaf pattern. The stylish hand painted ceramic dial incorporates a curved mercury thermometer within a dual fahrenheit & centigrade scale, and sits under a bevelled glass. In good working order, this barometer is in excellent cosmetic condition all round with only the light crazing on the ceramic dial one expects from barometers of such age, and combines the appeal of a traditional antique with a strong decorative quality. Weighing just over 1.3kgs, it measures 9" at its widest point, with a dial diameter of 5" and 2.75" depth. 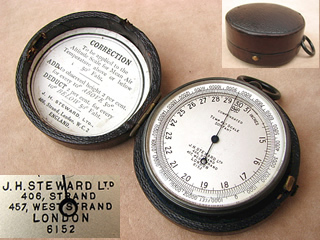 Dating to circa 1885, this is a nice example of a J Lizars pocket barometer & altimeter. The silvered dial is engraved 'COMPENSATED FOR TEMPERATURE, No. G38630, J. LIZARS, GLASGOW, EDINBURGH, ETC.' and has a barometric scale range from 23 to 31 inches. The altimeter scale is rotated by depressing and turning the knurled knob at the top, and has a scale range of zero to 8,000 feet. The case is made of gilded brass, and in good condition, retaining the majority of its gilding with the exception of the case back which is rubbed on part of its outer edges. It comes with a green silk & velvet lined case which is worn in places, and as with most of these antique cases is missing its push button, but has its retaining catch so still snaps shut. The silvered dial reads 'OLLIVANT & BOTSFORD. PARIS & MANCHESTER', and the brass case carries the makers mark PNHB on the reverse. This particular barometer has the unique feature of having two thermometers, one being a mercury type with Fahrenheit scale, and the other a red spirit type with Reaumur scale, both are intact and working although the red colour in the Reaumur tube has faded over time which makes the line harder to see from a distance. Not only is this barometer in full working order, but the cosmetic condition is exceptional and the photos don't really do it justice. This is much larger than similar examples measuring 8.25" at its widest point, 2.25" in depth and weighs 1.5kgs, it comes with its original post & ring ready to hang. This is a quite rare, 19th century pocket barometer & altimeter, by Thomas William Watson who is recorded as working at the Pall Mall address between 1878 & 1884. The nickel plated body is in excellent condition, and the silvered dial reads ‘T.W. WATSON, 4, Pall Mall, LONDON 306, Compensated’ all housed under a clear undamaged crystal. The barometric scale reads from 23 to 31 inches, with a rotating altimeter scale which ranges from zero to 8,000 feet. The barometer itself is in good working order, with a functioning adjustment screw on the rear, and it also passes the ‘plastic bag’ test. Although there is no outer case, it does come with a stylish double Albert chain and T bar. It measures 47mm in diameter, not including the stem or hanging loop, and is 18mm thick. A superb antique wall mounted barometer with the distinctive red & black letters on an attractive ceramic dial, signed A. W. Boatman, Southend on Sea, Grays Chelmsford, who were a firm of opticians originally founded in the mid 19th century. The company was renamed as A W Boatman & Son around 1905, and continued to flourish well into the second half of the 20th century. Dating to the latter part of the 19th century circa 1890, this is a quality barometer in full working order, set in a turned Oak body with a very stylish hand painted ceramic dial and bevelled glass. Measuring 9" overall with a dial diameter of 5" and 2.5" depth, this Victorian barometer is well over a hundred years old, and combines the appeal of a traditional antique with a strong decorative quality. Weighs just under 1.3kgs. A 19th century brass cased Holosteric barometer, signed by Gardener & Co, 53 Buchanan St, Glasgow, in gold lettering on the white card dial and retailed by them, but actually made by the firm of PHNB who were founded by Paul Naudet in 1860 to produce holosteric barometers after Vidies patent rights for aneroid barometers expired in 1859. They went on to become the most prolific French barometer makers of the second half of the 19th century, and their designs were later widely copied. The barometer dates to the 1860's which also ties in to the dates that Gardener & Co were at the Buchanan Street address. In full working order and very good cosmetic condition, the brass case is free from dents or dings and has its original post and hanging ring. It measures 5" (125 mm) at its widest point, and 2" (50 mm) in depth and weighs just over 650 grams. This is an aneroid pocket barometer with a revolving altimeter scale measuring zero to 10,000 feet. Dating to the last quarter of the 19th century it's signed 'Dollond London, Compensated' on the dial and is also compensated for temperature. The case is made of brass with a blued finish, and is in good dent free condition retaining virtually all its finish. It comes with its original green velvet & silk lined leather case, which is in very good condition with both the hinge and catch in working order. The barometric scale ranges from 21 to 31 inches and all the lettering and numbers are etched into the aluminium dial. A high quality Victorian pocket barometer in full working order (it passes the plastic bag test), it measures 50mm diameter and 15mm in depth. This is an unusual example of a 19th century aneroid pocket barometer & altimeter of a smaller size than the norm measuring just 40mm in diameter, compared to the more standard diameter of 50mm. The silvered dial is engraved 'Compensated , J. Brown, Optician, Glasgow' who is recorded as working between 1871 to 1900, and has a barometric scale range from 23 to 31 inches. The barometer casing is made of polished brass, and in good condition, with no denting or rubbing. A very clean & tidy pocket barometer of a rare size with a chip free bevelled glass, it's in full working order, it also passes the plastic bag pressure test. This is a superb antique aneroid rope twist barometer with very attractive ceramic dial, by G R Eve & Co, North Shields. Dating from the last quarter of the 19th century, this is a quality barometer in full working order, set in a mahogany body with a very stylish hand painted ceramic dial and bevelled glass. Measuring 9" overall with a dial diameter of 7" and 2.5" depth, this is a large barometer in very good condition, which combines the appeal of a traditional antique with a strong decorative quality. This is a quite unique aneroid barometer by the famous French makers, Lerebours et Secretan. Established in 1845, they became the foremost instrument makers of their time both in France and the rest of Europe, and pieces by them are very scarce and not usually found outside of museums. This barometer with curved mercury thermometer is a fine and rare example, and dates to between 1845 to 1855, (this was the period that Lerebours et Secretan worked from the Pont Neuf address). Signed on the dial ‘Lerebours et Secretan, 13 Pont Neuf, Paris’ the barometer and thermometer are in full working order, and it still passes the plastic bag test. Measuring 5" in diameter at its widest point, the brass case is dent free and has the pleasing dark patination that only comes with the passing of time. A genuinely rare antique which would grace any collection. Dating to the late 19th century it's signed 'Army & Navy Stores Ltd, London' on the dial and is also compensated for temperature. The case is made of gilded brass, and is in good dent free condition, with most of its gilding intact, although there is some loss on the back (see last photo). It comes with its original velvet lined leather case, embossed W.O. on the lid, and is in very good condition with both the hinge and catch in working order. The barometeric scale ranges from 21 to 31 inches and all the lettering and numbers are etched into the aluminium dial. A clean & tidy pocket barometer in full working order (it passes the plastic bag test), it measures 50mm diameter and 15mm in depth. This is a quite impressive brass cased Ships bulkhead Marine barometer which incorporates a curved centigrade & Fahrenheit thermometer on the dial. The brushed aluminium dial carries the name John Barker & Co Ltd, Kensington and Marine Aneroid. It has a brass case mounted on to what appears to be an oak back plate, with two brass wall hanging brackets, and is of substantial proportions, measuring 11” at its widest point with a 7” dial & 4” in depth. It dates to the early 20th century, circa 1910, and is in very good condition as can be seen in the photos, with no dents to the brass casing, just a few tarnish marks here and there. The oak back is also in good condition, no splits, gouges or cracks. In full working order including the thermometer, this is a quite unique barometer which really would be a showpiece for any setting. Overseas buyers please note: Due to size & weight, delivery will be by courier and therefore it is important that a contact telephone number be entered through the shopping cart at checkout stage. This is a superb example of a brass cased aneroid barometer with an open faced dial incorporating a curved Fahrenheit thermometer. The rear of the case is engraved ‘Marratt & Ellis, Opticians, 63 King William St, London Bridge’ who worked at this address from 1874. 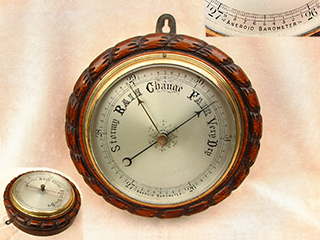 This barometer is in very good condition as can be seen by the photos and simply oozes quality. Not only is it free from any damage or dents, but there is a pleasing patina to the brass case and the silvered aluminium dial is divided in inches of mercury from 28 to 31, some minor fading on the letters. It’s in full working order including the thermometer, passes the ‘plastic bag’ test and the thick bevelled glass is also in excellent condition with no chips or cracks, so barometer is ready to hang. The barometer can be adjusted by means of an adjustment screw on the back and measures 130mm diameter at it's widest point, and 50mm in depth. This is a superb antique aneroid rope twist barometer with very attractive ceramic dial, by G F Brown & Co Carlisle. Dating from the last quarter of the 19th century, this is a quality barometer in full working order, set in an oak body with a very stylish hand painted ceramic dial and bevelled glass. Measuring 9" overall with a dial diameter of 7" and 2.5" depth, this is a large barometer in very good condition, which combines the appeal of a traditional antique with a strong decorative quality. This is a handsome Edwardian aneroid wall barometer by Dollond of London, set in a turned Oak case. The attractive silvered dial is engraved 'Dollond London', and covered by a thick bevelled glass retained in its original brass bezel. In excellent clean condition all round and measuring just under 7" diameter overall, the dial is a little over 5" diameter. Barometers by Dollond are quite sought after, and this is a nice example in full working order, a great decorative piece by a renowned maker dating to around 1910. An impressive 19th century aneroid barometer with curved mercury thermometer, signed 'GRAY & SELBY, Nottingham' on a traditional ceramic dial, set under a thick bevelled glass within a brass bezel. It dates to around 1885, and is a rare example by a partnership of instrument makers who are believed to have been active from the second half of the 19th century. Measuring just over 7" diameter at its largest point, the dial is 5" in diameter, and total depth is 2 1/2". Set in a ropetwist Oak surround, this is a very decorative antique barometer in superb condition as can be seen from the photos, and in full working order. This is a handsome pocket barometer with a revolving altimeter scale measuring to 8000 feet. The silvered dial is engraved ' Moody Bell & Lamb Ltd, Cheltenham Spa' and it probably dates to the beginning of the 20th century. The case is made of gilded brass, and is in super condition, with all its gilding intact, plus a very clean dial and crystal. The barometeric scale ranges from 23 to 31 inches and all the lettering and numbers are etched into the dial. In full working order (it passes the plastic bag test), it measures 47mm diameter and 18mm in depth. Although there is no case, it will be supplied with a modern plush presentation box, so would make an ideal gift. Vintage aneroid wall barometer by Negretti & Zambra, set in an impressive red mahogany case. The attractive silvered dial is engraved 'Negretti & Zambra London, No 28715',and also has the famous intertwined N&Z logo. The red mahogany case is decorated with a distinctive stringing and has a rich patination to it. In excellent clean condition as is the bevelled glass cover and measuring just over 7" diameter overall, the dial is a little over 5" diameter. A superb example in full working order, a great decorative piece dating to around 1900. Brass cased ships aneroid barometer, signed T Wheeler London No 5336, Compensated II. Wheeler made many instruments for the Royal Navy during WW1 and this one also carries the war department arrow both on the dial and case. With a finely graduated matt silver dial, marked in inches of mercury from 26 to 31, its in good cosmetic condition, save for a 15mm scratch on the glass and some very light tarnishing on the underside, but with a nice age patination all round. A fine example in original unrestored condition, and in full working order. Measures 5" at its widest point, and 2" in depth. Probably dating from the third quarter of the 19th century, this rare pocket barometer with curved thermometer was made by Dixey, and is signed Dixey, Optn to the Queen, New Bond St, LONDON.. This maker was known to be working from this address from 1845 and was renowned for producing high specification instruments. This barometer has a barometric scale of 27 to 32 inches, and is compensated for temperature. The gilded case shows some scuffing on the back, but otherwise in good condition including its green silk lined leather case which retains its button catch. Barometer measures 45mm dia x 15mm depth, and all is in full working order including thermometer. An exceptional instrument that still has a practical use today. Stunning 19th century aneroid barometer with curved mercury thermometer, signed 'JOSEPH DAVIS & Co, Fitzroy Works, Kennington, London S.E.' on a traditional ceramic dial, set under a thick bevelled glass within a brass bezel. Dates to around 1890, and is a superb example by a quality barometer maker who first started business in 1868. Measuring just over 7" diameter at its largest point, the dial is 5" in diameter, and total depth is 2 1/2". Set in a ropetwist Oak surround, this is very, decorative Victorian barometer in excellent condition, and fully working. In excellent condition, this is a stunning 19th century pocket barometer/altimeter with revolving altitude scale of 0 - 8000 feet. Made by M. P. Tench, 153 Fleet St, London. The case is gilded and incorporates suspension ring, with a nice clean silver dial engraved with makers name as above. Housed in a brown leather covered case lined in green velvet and silk, all in good order with working internal catch. Barometer measures 45mm dia x 15mm depth, and is in full working order. A superb brass cased French Holosteric barometer, signed and retailed by E Lennie, Edinburgh, but actually made by Paul Naudet, who was France's premier barometer maker of the second half of the 19th century, both dial and case carry his marks PHNB. In full working order and very good condition, the dial in particular is virtually mint, and the brass case is free from dents or dings, with only minor surface blemishes on the back. Please study the photos to appreciate the excellent condition of this piece which has obviously been well cared for . Measures 5" at its widest point, and 2" in depth. Aneroid rope twist barometer with very attractive ceramic dial, by J Hall Opticians Bradford. Dating from the 1st quarter of the 20th century, this is a quality barometer in full working order, set in an oak body with a very stylish ceramic dial and bevelled glass. Measures 7.5" overall with a dial diameter of 5" and 2.5" depth. Cosmetically in very good condition, this is a handsome piece, with only some tarnishing on the edge of the brass bezel. Brass cased aneroid barometer, signed J D Fisher 228 High St, Lincoln, dating to the latter part of the 19th century. In full working order and good cosmetic condition, no dents or glass damage, some tarnishing but still retaining most of its original brass finish. The hanging loop and stem is also original. and the dial is very clean. Measures 5" at its widest point, and 2" in depth.